Pacquiao Vs Algieri live fight on HBO PPV as it happens at the Venetian Macao's Cotai Arena in Macau, China on Saturday night, November 22, US time (Sunday morning, Nov. 23, Macau time). There will be lots of live streaming videos online for the Pacquiao Vs Algieri fight, but this one is the official, authorized and legitimate live stream: the HBO Pay-Per-View (PPV). Sadly, it isn't free. Live broadcast starts at 9PM ET / 6PM PT on Saturday, US time (Sunday morning, Macau/PH time). It will be Pacquiao's 63rd fight in his career, and I'm hoping it will already be his 2nd to the last, if ever the super fight against Floyd Mayweather Jr. will push through in 2015. He already won 56 times (38 via knockouts), lost 5 times and fought to a draw twice. 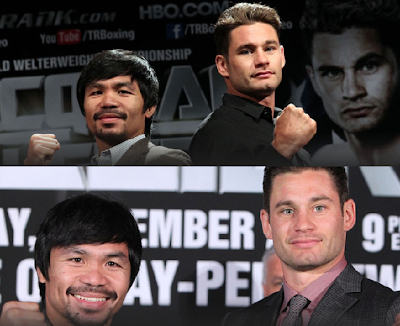 Looking at Algieri's records, he's no match to Pacquiao when it comes to "experience". He fought only 20 times, but his biggest edge is that - he's undefeated. However, he only scored 8 knockout wins out of 20. Before this Pacquiao vs Algieri main card fight, there will be 8 undercard fights first featuring boxers from different countries, including another one from the Philippines. I posted the full details below.